The authority following the viewfs:// scheme in the URI is the mount table name. 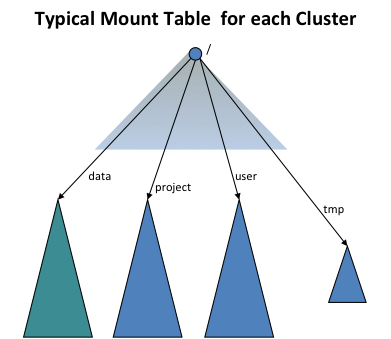 It is recommanded that the mount table of a cluster should be named by the cluster name. Then Hadoop system will look for a mount table with the name “clusterX” in the Hadoop configuration files. Operations arrange all gateways and service machines to contain the mount tables for ALL clusters such that, for each cluster, the default file system is set to the ViewFs mount table for that cluster as described above.